Hydrocar introduces students to the hybrid technology that is fueling today’s automotive revolution! 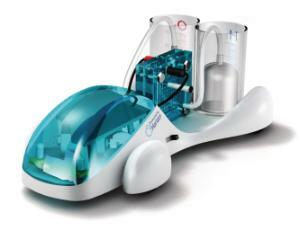 Hydrocar demonstrates a complete, clean-energy system with solar to hydrogen power generation. Powered by electricity from sunlight, the reversible fuel cell illustrates the principles of water electrolysis, separating hydrogen from water and then recombining these elements to create power in an extremely efficient process. The fuel cell unit combines water electrolysis and fuel cell functions into one device. Its futuristic design, also allows the car to move around obstacles unassisted — the car steers independently of the user once it hits a barrier, and cool blue LED lights flash from inside the cockpit. Size: 30.5 x 20.5 x 10 cm.